"We’re deploying a new cycle of Opera, with a focus on improving Reborn 3. Thank you for your very warm welcome, and lively discussion on our last blog post. We’ve already fixed some UI bugs, and additional work is in progress." - DNA-75232 Reborn 3 Web UI bugs. - DNA-75312 Mouse gestures do not work on isolated content. - DNA-75590 [Win] Address bar focus ring flickers when changing tabs. - Some of new popups are adjusted to Dark theme. - DNA-75631 No option button for some extensions. - DNA-75492 [macOS] – Unify margins in address field. - DNA-75826 [macOS] Address bar – focus – wrong font colour. - DNA-75660 Crash at sync_bookmarks::SyncedBookmarkTracker::CheckAllNodesTracked(bookmarks::BookmarkModel). - DNA-75661 Crash on exit at opera::PowerSaveModeControllerObserverBridge. - DNA-75728 Crash at non-virtual thunk to opera::SearchCopyPopupView::ButtonPressed. - DNA-75807 Crash at opera::ActivePageViewTracker. The Chromium has been updated to version 73.0.3683.20. 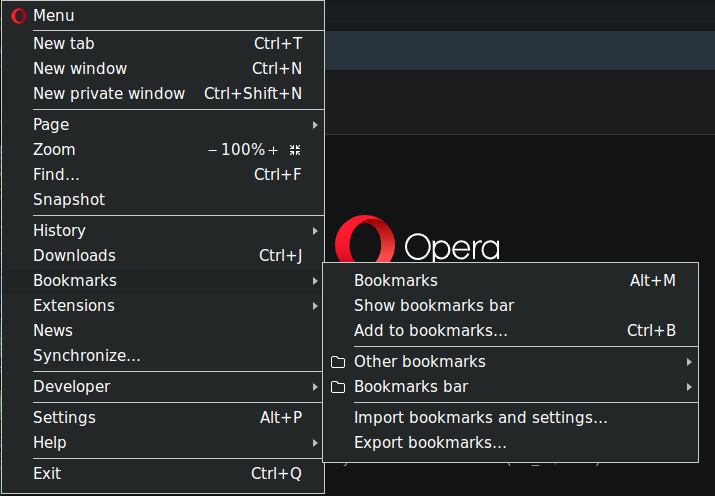 @l33t4opera no changes in Opera Menu and context menu in dark theme? Hi @jojo0587, what changes do you mean? @l33t4opera I have already written in Disqus(?) nn the Opera Blog with the first version of the developer from R3. For me, the Opera menu and context menu look a bit strange. As if they were made with high contrast for people with eye defect. I do not know, maybe it's a matter of habit but so far I do not like it. And how do you think it should look? For me, it's perfect. @leocg I think I would have an idea. For example, the dark theme in the GIMP program. The menu has the same color as the rest of the program, it has no white border on all four sides, but everything is legible. And the menu separators are not white. I know that the theme in Opera will be darker, so as in GIMP, give up the menu border and the separators instead of white ones give a gray one? So you think there should be a gray mode? I've w-a-i-t-e-d years for dark mode finally all dark, eureka! Also background Personal News Jumping Jehosophats, it works. Can the index possibly swing in or out? Also my Downloads [More] button reveals a blank page? @leocg no, the new dark color of the Opera is OK. I just wanted to write on the example of GIMP that the white border around the menu may be unnecessary, and the separators that separate some options do not have to be white, for example, they may be gray. On two separate computers using different graphics cards, I have found a visual bug when using the minimize button in the titlebar using Windows 10. If I minimize the window using the minimize button in the titlebar, when I restore the window from the taskbar, the minimize button appears to be hovered, even though it is not. If I mouse over the button, it goes back to how it should look. This happens in both the light and dark themes. If anyone else can confirm, and also let me know where to file a bug, I would be happy to file the bug. In the latest developer build? That problem happened in some previous builds but should be fixed already. @leocg - yes, it's happening in the current build, 60.0.3236.0. - Unpinning sidebar is reflected to the change on the Easy Setup panel. - Some dark-themed pop-ups are more readable now. - Clicking on ‘Extension options’ works again. Snap packages are not available for this version." - DNA-71064 Crash at ToolbarActionsModel::AddItem(ToolbarActionsModel::ToolbarItem). - DNA-75717 Renderer crash at base::Value::InternalCleanup(). - DNA-75779 Move page actions buttons from addressbar to toolbar. @lucasnorthmi51959 I am not going to give up the Opera by a few functions that are important to me. But just Vivaldi in terms of color settings raises Opera. I would like the functionality of the Opera to be similar. Everyone could then make their motif 100% tailored to each other. "It contains many improvements in dark mode, and some platform-specific fixes." The Chromium has been updated to version 73.0.3683.46. Latest changes have made me switch to Opera from Firefox. Firefox gets slower with each release... keep up the good work! "With this build, we’re providing more Reborn 3 visual improvements." Also, you can select (again) maximum number of columns on the Speed Dial: go to opera:settings/startPage, disable "Automatically adjust the maximum number of columns", and below you should see "Maximum number of columns" option. - DNA-75127 [Mac] Context menus in dark mode. - DNA-75442 Sidebar menu dialogs in dark theme. - DNA-75507 [Dark] ‘New extension’ popup is unreadable. - DNA-75546 Lack of devices in Tabs list after sync. - DNA-75886 Add possibility to manually control the SD max column count. - DNA-75922 CryptoWallet on Desktop: Enable / Disable from Settings and EasySetup. - Bookmarks bar folder pop-up looks nicer in dark mode.